Where Do Your Pledge Dollars Go? 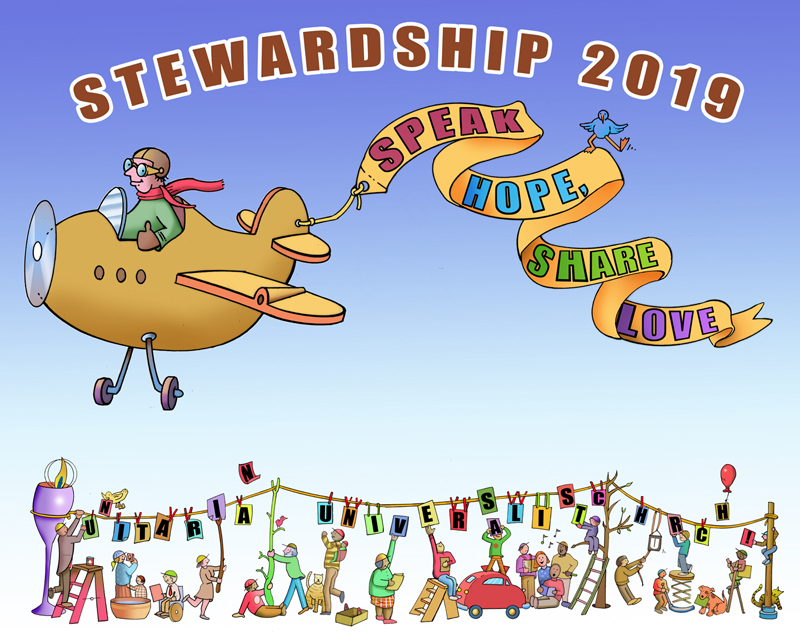 The stewardship campaign challenges each of us to speak our hopes and share the love of a community that is made more whole by our actions to realize those hopes. As in previous years, our primary goal is to receive pledges from 100% of those who consider UUCC a spiritual home – both members and friends of the congregation. Pledging is not an exercise in brinkmanship that risks your financial future, but instead asks you to live within your means to support the work of this church that plays a role in your spiritual journey and practice. Guidelines for giving can be found on the reverse side of the pledge card and online. Pledges enable us to plan a realistic budget. While cash donations in the offering basket are greatly appreciated and are used to help support the church and its causes, they are unpredictable – so we rely on the pledge commitments of our community of members and friends to set our budget. Your pledge will be for our upcoming fiscal year – July 1, 2019 to June 30, 2020. 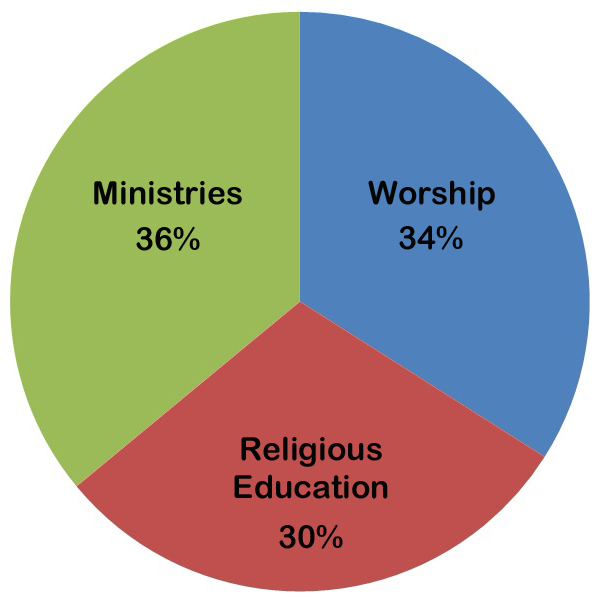 Pledges made during the stewardship campaign constitute about 90% of church income. The remainder comes from pledges made at other times, undesignated Sunday offerings, facility rentals and fund-raisers. In the 2018-2019 fiscal year ending June 30, we have budgeted $348,558. Enhance funding of our exciting music programming. More fully fund new ministries including Adult R.E., the Accessibility and Inclusion Ministry Team, the Sanctuary Team, and more. Meet the rising costs of health insurance for our staff. The pie chart at right shows the proportions of our projected 2019-2020 budget that will go to worship, religious education and ministries. Each category includes associated staff, administrative and facilities expenses. The amount you pledge is your personal decision based on your financial resources and needs. The Stewardship Team asks that you consider the UUCC Fair Share Guidelines you will find on the back of this year’s pledge cards and online. Most of our members are able to contribute on a regular basis, and many households already pledge at the suggested levels. For those who do not, we ask you to work toward meeting the guidelines over time. For newer members and friends, we ask that you consider pledging an amount that reflects a serious commitment to the church you have chosen as your spiritual home. We estimate that we can meet our dollar target if current pledgers will increase their pledges by 5% to 15% and if new pledgers will pledge at least $30 per month. Pledge cards, available in the Greeting Area, can be turned in at the stewardship table, placed in the offering plate, given to any Stewardship Team member or the church administrator, or mailed to the church.